Are you the dancing-on-tables type for New Year’s Eve? Or do you prefer a quiet evening at home? Believe or not, I do remember one New Year’s view from the top of a table, but these days I’m more of a ‘somewhere-in-the-middle’ girl. Dinner out with a group and a small dessert celebration back at home. 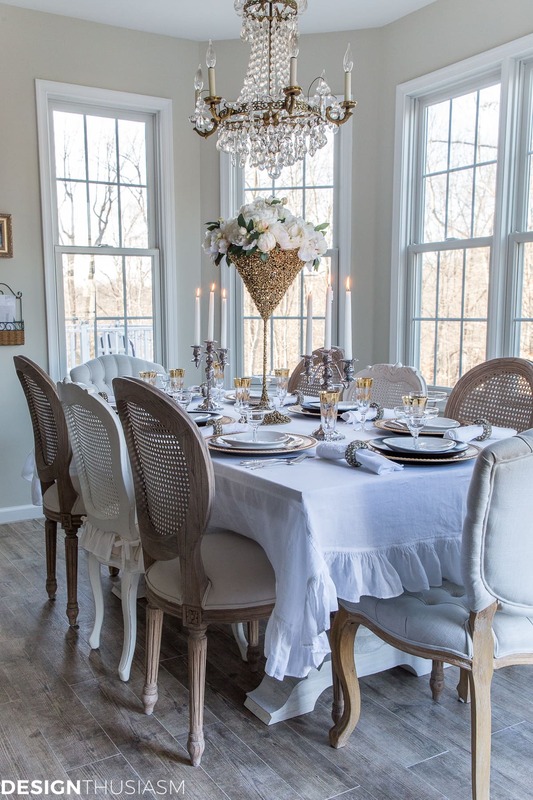 Or a festive but contained dinner party at the house. Either way, I’ve always enjoyed celebrating New Year’s and the promise that it brings for a fresh new beginning. If you’re planning a New Years Eve party in your home but don’t have much energy for decorating after the December holidays, here are 6 easy steps for setting a fabulous table that delivers that WOW factor, but looks way more difficult to put together than it is. 1. 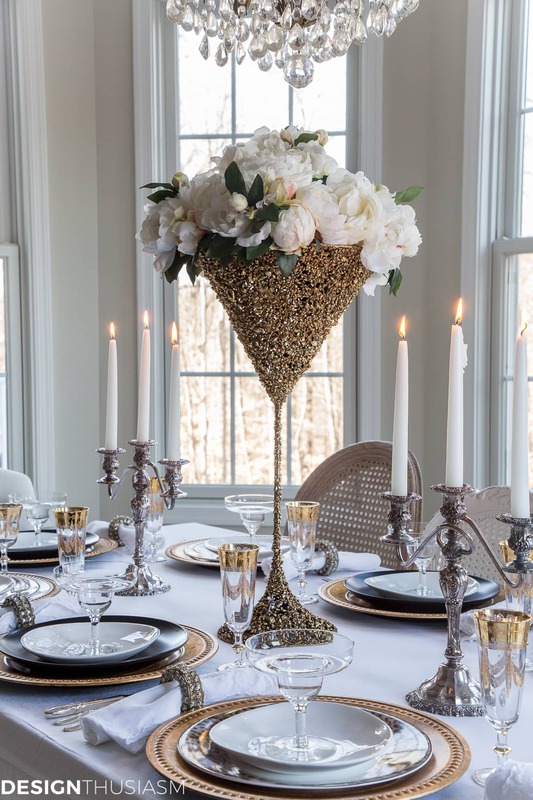 A bold COLOR palette – The very first thing I always determine is my color story and for a bold New Year’s Eve statement, I used black, white and gold on this table. 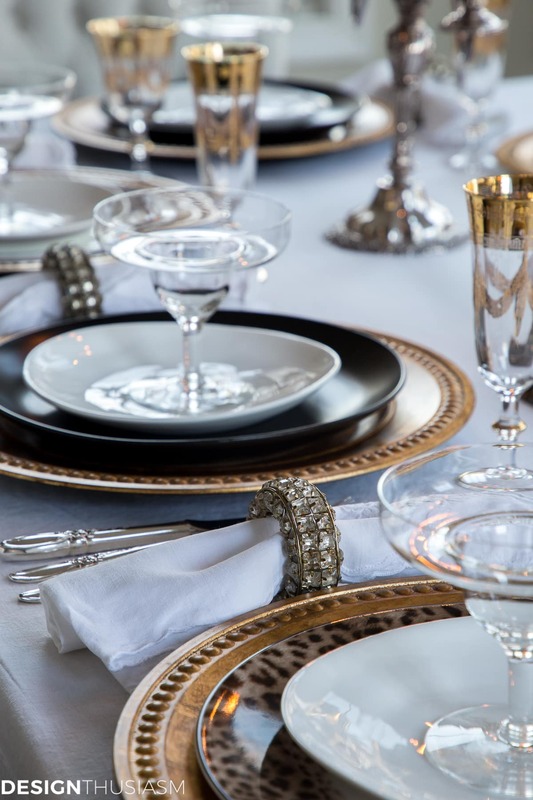 For me, New Year’s is the most formal of all the holidays and mimicking black tie elegance on your table is a super easy way to communicate that formality. You might also try black, white and silver or black, white and red for the same level of drama. 2. 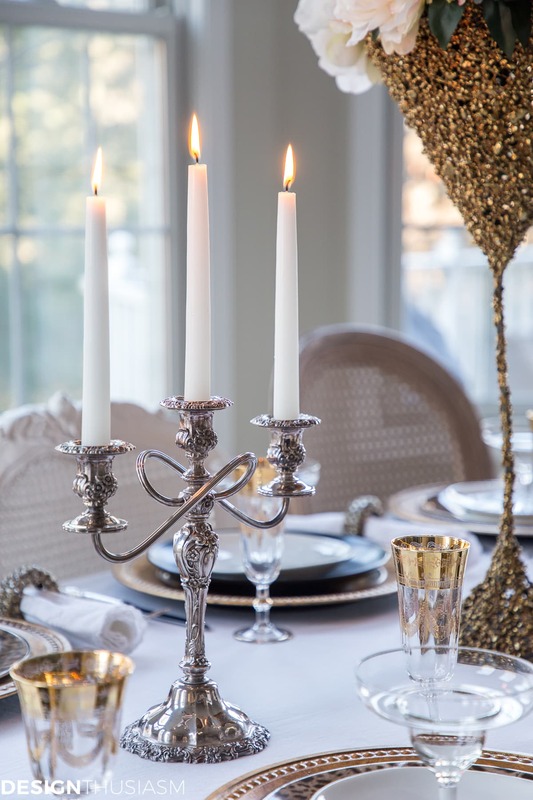 A healthy dose of BLING – I adore patina, neutrals and understatement, but a New Years Eve party is a great time to pull out all the stops. 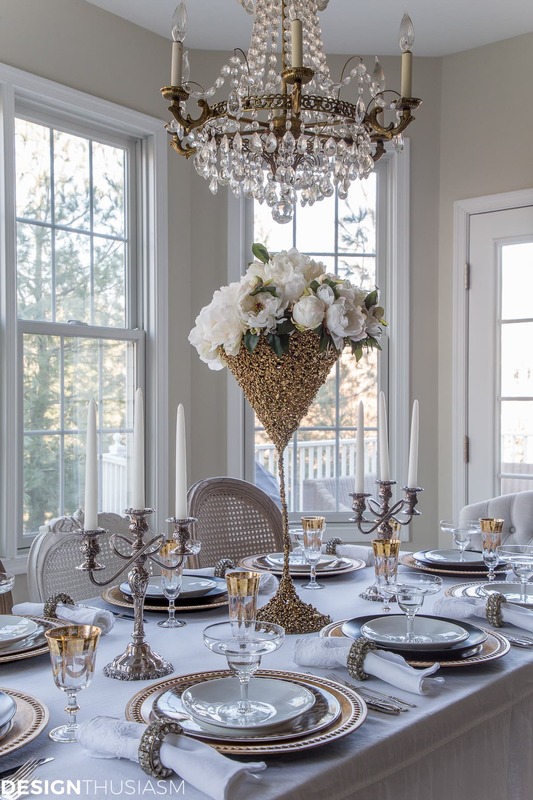 Gold and silver metallics, sparkling crystal, iridescent accents. This is the time to use it all. Tastefully, of course, but there’s no need to hold back on elegance. 3. 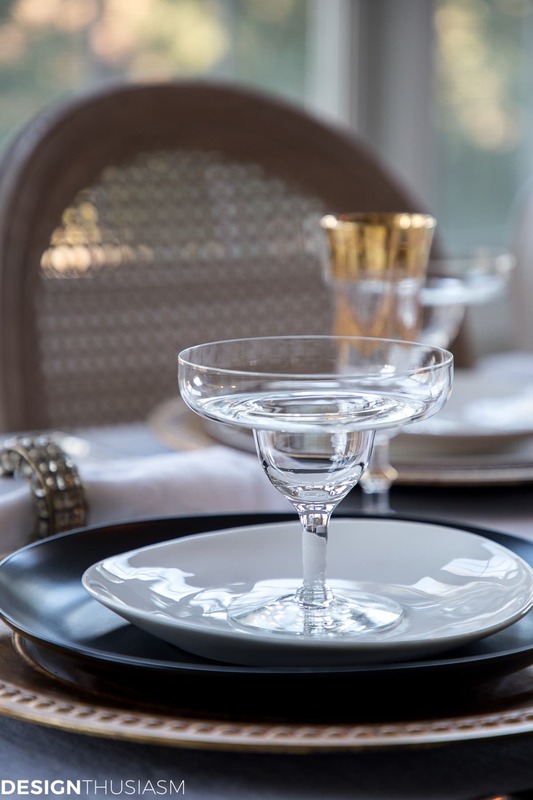 An impactful FOCAL POINT – I try very hard, with all my table settings, to work with what I already own and rearrange it to look new. For this table I bought only one new thing, but it’s the thing that most defines the table. I found a wonderful glittering giant martini glass planter at my local garden center among the Christmas items. I immediately thought of New Year’s. The long spindly stem raises the flowers high, making it not only striking, but easy to converse across the table. Instant centerpiece! 4. Add unique INTEREST – As a counter to the basics, I like to include a few unique tabletop items that add a bit of a twist to what might be expected. This is often where I look to mix and match dishes, and on this table I mixed animal print dinner plates in with the black, white and gold theme. You don’t have to worry if you don’t have enough of one pattern. Just mix it up! 5. Classic FOUNDATION pieces – Despite all the bling and drama, this table is mostly comprised of very basic pieces, and this is what makes it so simple to pull together. The same washed linen tablecloth I used on most of my tables. Basic black dinner plates and salads plates in plain white. Painted gold chargers that unite it as a whole. 6. Elegant final DETAILS – The final element is the finishing touch pieces, and this is where I went with classic elegance. 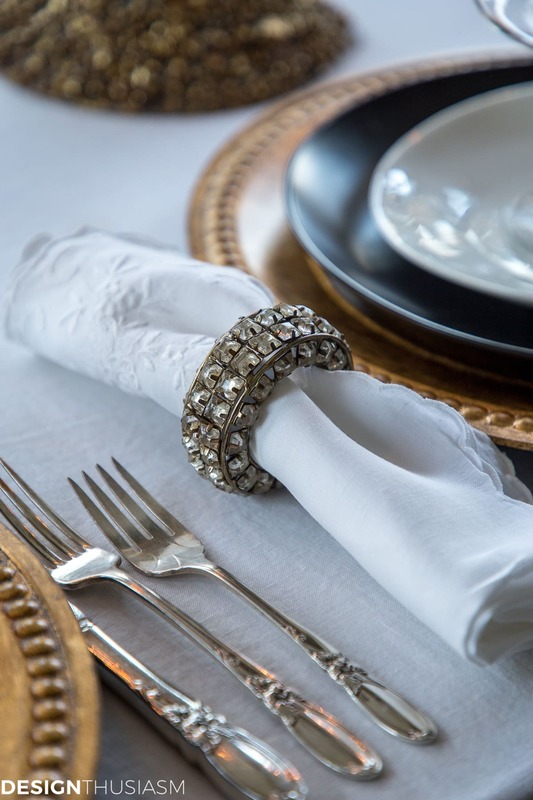 Pretty silver flatware, embroidered white napkins and crystal bracelet napkin rings. These are the ‘go-to’ pieces you’d expect to find on this sort of table and they don’t disappoint. Being able to depend on them makes table setting easy. When I set my tables, as much as I plan, the final decisions are always made at the table. I walk around and around, moving things back and forth, pulling out alternate options and stepping back to get a good view. Elements are stored in various rooms in my house and I wind up climbing on chairs and step stools to get everything I need. This winds up being a physical activity for me, and it matters what’s on my feet. The task here was made easier by my sponsor, Easy Spirit as part of their #MoveFor the Holidays campaign. They provided these suede tall heeled boots that are super comfortable but also look great. If guests arrive early, there’s no reason to change! *I was compensated for this post but all opinions are my own. Ultimately what makes this table so easy to pull together is the harmonious mix of pieces that each carry their own weight. The bold color balances the grandness of the bling, while the classic foundation tempers the more exotic items. Elegant details are expected, yet the focal point is not, instead offering a more theatrical surprise. Being able to move so easily and play around with the various elements is what gives me the freedom to create and keeps my styling at its best. Unfortunately, however, I didn’t leave enough room for climbing up and dancing on the table. New Years Eve party table resource list – To get the look, click on the items below for direct links to the products. Where actual items were no longer available, I’ve provided similar options. You were those boots well! Boots look great! I LOVE the centerpiece! You’re brilliant! (And beautiful)! Thanks for the awesome party ideas! Merry Christmas! This is stunning! I love how elegant it is.Merry Christmas! 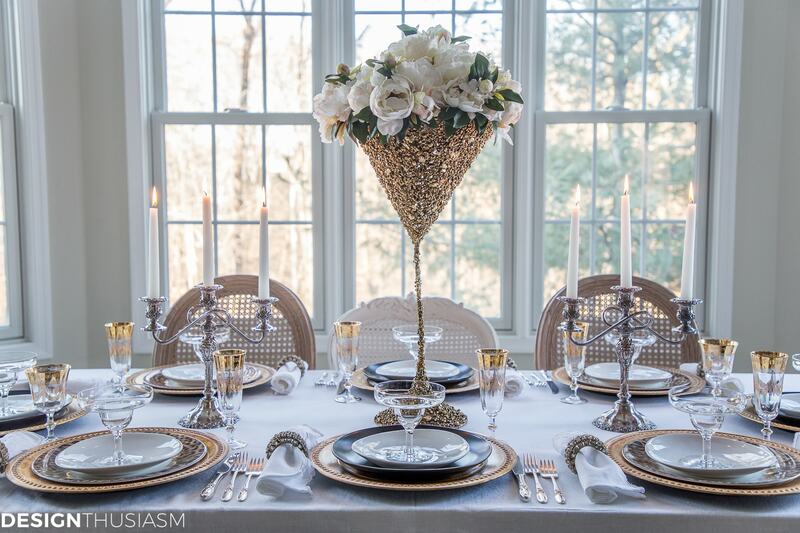 Thank you for sharing your very glamourous New Year’s party table on the blog hop. Happy holidays! It’s stunning! I hope you have a Happy 2019! Thanks so much!! Right back to you!